Home / Uncategorised / Why should you buy a TV Bed? Why should you buy a TV Bed? As you can imagine we’re big fans of TV Beds, here at the TV Bed Store. And the reason? We genuinely believe in the products we sell. Over half of adults now have a TV in a bedroom, that’s a lot of wires to trip over and large TV’s looking unsightly. A TV Bed is a simple and elegant way to not only hide a TV in the bedroom, the beds now available on the market come in a huge range of options from the super hi-tech to the entry level but there is a common thread running through every bed we sell, and that’s quality. First and foremost, a TV Bed is a great way to hide a TV. It’s that simple. The TV is stalled in the footboard of the bed and when the TV is not being used, a button can be pressed which reveals the television. The bed below is the ever popular Hollywood TV Bed. This bed doesn’t have some of the bells and whistles of some of our Media Beds but will make a simple, elegant and stylish addition to any bedroom. At the other end of the scale, there is the Media Beds, we mentioned above. If a surround sound viewing experience is your thing, or if you simply loving gaming whilst lying in bed, you could do worse than looking at one of these. TV Bed technology has really snowballed in the last two years. Whereas a TV Bed used to be a nifty way to hide a TV, a Media Bed is really more akin to a sophisticated media unit, you just happen to be able to place a mattress in the middle of it! The bed below, The Jetson Ottoman, King Size, comes with USB points, subwoofers and integrated stereo speakers. To be quite honest, the kit that comes with this one would put most seperate hi-fi systems to shame. We mentioned this bed was an Ottoman, so not only do you get all of the tech, but you also get all of the storage too. So, why should you buy a TV Bed? If you are looking for a stylish way to enjoy watching TV in the bedroom then think about a TV Bed. 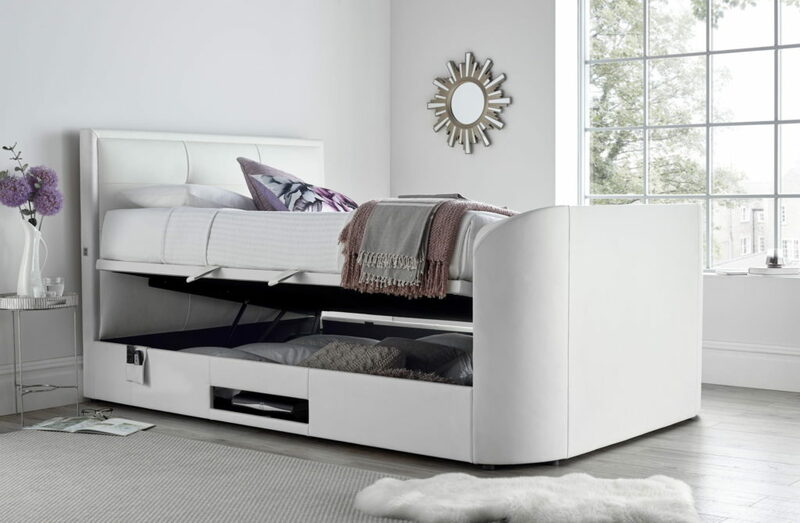 But you should also think about a TV Bed if you want to save space and create extra storage. There could be many reasons why you want to invest in a TV Bed, and you can be sure that when you buy from TV Bed Store you are buying into the best products on the market right now and from a family run company who believe in offering an unparalleled level of customer service, and the personal touch.